The Lumex Set n’ Go Wide and Height Adjustable Rollator by Graham Field offers the convenience and flexibility of a two-in-one products all rolled into one with an added offering for larger individuals. 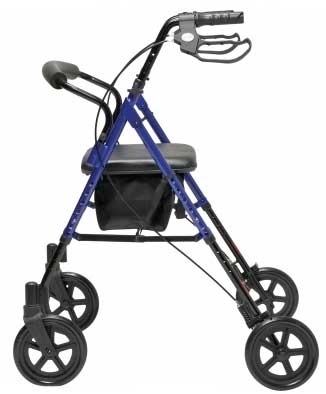 Designed with multiple height settings on the frame, the Set n’ Go Rollator allows the seat height to be adjusted from a hemi 19.5” to a standard 23.5” in 1” increments. This accommodates for a broad range of user heights which in turn offers more comfort for the user when seated. It also has a removable padded backbar with easy release pull knobs. 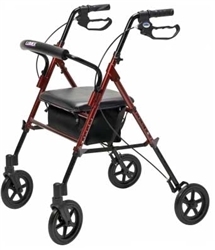 With it’s enhanced wider spacing of 19.5” in-between the handgrips and larger 15.75” seat, the Set n’ Go Wide is ideal for those users needing a little more room for comfortable movement and seating. The comfortable, wide, seamless padded seat includes a zippered pouch under the seat for security of personal items. It also includes a black pouch for storage of larger items. It has ergonomic handgrips that offer a comfortable grip. The adjustable height handle adjust with easy to use knobs. The easy to operate locking and “quick stop” loop brakes help provide additional safety and security (pull up to stop, push down to lock). The 8” wheels are idea for indoor or outdoor use.